Gene Hackman is a retired American actor and novelist. Hackman was born in San Bernardino, California, the son of Lyda (née Gray) and Eugene Ezra Hackman. He has a brother, Richard. Hackman's family moved frequently, until finally settling in Danville, Illinois, where they lived in the house of his English-born maternal grandmother Beatrice, and where Hackman's father operated the printing press for the Commercial-News, a local paper. Hackman's parents divorced in 1943, and his father subsequently left the family. At 16, Hackman left home to join the U.S. Marine Corps, where he served four-and-a-half years as a field radio operator. After his discharge, he moved to New York, working in several minor jobs. His mother died in 1962 as a result of a fire she accidentally set while smoking. Legend says that Hackman and Dustin Hoffman were voted "least likely to succeed." Hackman next moved back to New York, where he worked in summer stock and off-Broadway. In 1964, he was cast as the young suitor in the Broadway stage play "Any Wednesday." This role would lead to him being cast in the small role of Norman in Lilith (1964), starring Warren Beatty. When Beatty was casting for Bonnie and Clyde (1967), he cast Hackman as Buck Barrow, Clyde's brother. That role earned Hackman a nomination for the Academy Award for Best Supporting Actor, an award for which he would again be nominated in I Never Sang for My Father (1970). In 1972, he won the Oscar for his role as Jimmy "Popeye" Doyle in The French Connection (1971). At 40 years old, Hackman was a Hollywood star whose work would rise to the heights with Night Moves (1975) and Bite the Bullet (1975), or fall to the depths with The Poseidon Adventure (1972) and Eureka (1983). Hackman is a versatile actor who can play comedy (the blind man in Young Frankenstein (1974)) or villainy (the evil Lex Luthor in Superman (1978)). He is the doctor who puts his work above people in Extreme Measures (1996) and the captain on the edge of nuclear destruction in Crimson Tide (1995). After initially turning down the role of Little Bill Daggett in Clint Eastwood's Unforgiven (1992), Hackman finally accepted it as a different slant on the western that interested him. For his performance he won the Oscar and Golden Globe and decided that he wasn't tired of westerns after all. He has since appeared in Geronimo: An American Legend (1993), Wyatt Earp (1994), and The Quick and the Dead (1995). 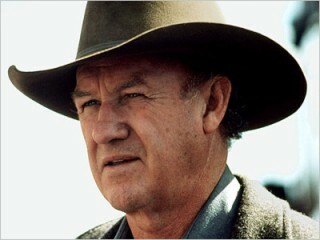 View the full website biography of Gene Hackman.